After I start to live in Taipei, eating Asian cuisine every day, I try to prepare dishes that mix local ingredients and western cooking method. I was inspired to make this recipe by the delicious Taiwanese Kimchi that a lovely lady in Taoyuan gift me some days ago. Taiwanese Kimchi is an interesting way to prepare and preserve raw cabbage: fresh and spicy usually is served as an appetizer or a side dish. Prepare rice in rice cooker. When it's done, take aside and prepare pork fillet. Heat a tick fry-pan and put in the pork fillet. Roll on every side until well roasted. Continue to cook until Sake is almost evaporated. Put kimchi salad in the pan around the fillet and let cook on low heat until is warm. 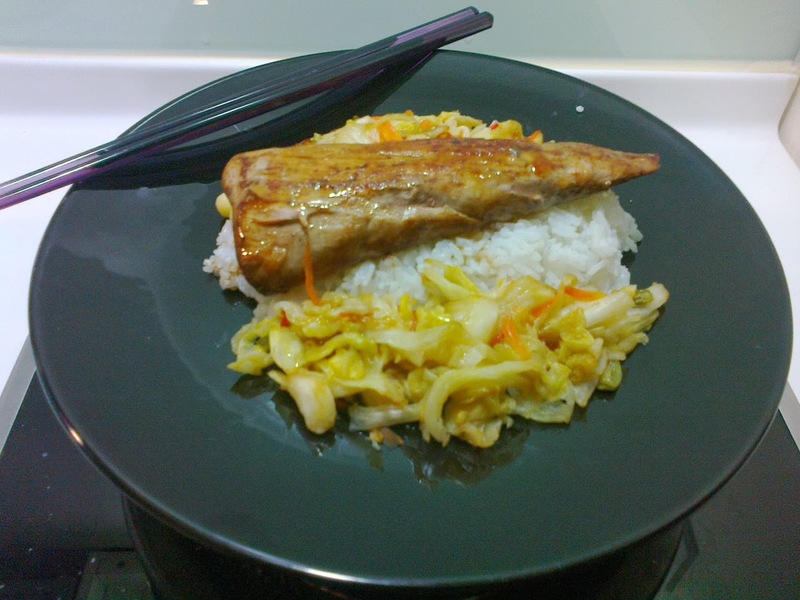 In the center of a large dish, poor rice and sprinkle Kimchi around it and poor pork fillet on top of rice. Add the remained Sake in the pan where cooked fillet in order to dissolve and collect all of the cooking juice, on medium heat. Allow to thicken and stream on pork fillet.